Simon & Schuster, 9781451608120, 384pp. The fifth installment in the New York Times bestselling series by Lisa Lutz, featuring the fearless private investigator Izzy Spellman and her quirky, yet endearing, family of sleuths. For the first time in Spellman history, Isabel Spellman might be the most normal member of her family. Mom has taken on an outrageous assortment of extracurricular activities. Dad has a secret. Her brother and sister are at war, but neither will reveal the source of the conflict. While domestic disturbances abound, there is one source of sanity in the Spellman household: Demetrius Merriweather, employee of the month for eighteen months straight. Things aren’t any simpler on the business side of Spellman Investigations. First, Rae is hired to follow a girl, only to fake the surveillance reports. Then a socialite has Isabel tail her husband, despite a conspicuous lack of suspicion. A man in a sweater vest hires the Spellmans to follow his sister, who turns out to be the socialite. Izzy won’t stop hunting for the answers—even when they threaten to shatter both the business and the family. Readers are sure to love the next novel in a “series that keeps getting better and better” (Publishers Weekly, starred review). 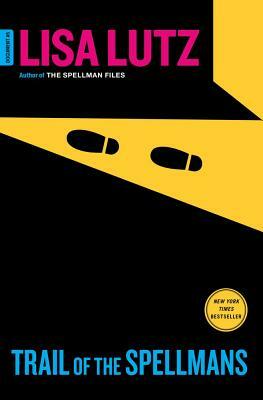 Lisa Lutz is the author of the New York Times bestselling, Edgar Award– and Macavity Award–nominated, and Alex Award–winning Spellman Files series, as well as the novels How to Start a Fire, The Passenger, and The Swallows. She lives and works in upstate New York.